Can it possibly be true? Sounds like it here --if you read Sid Terror's personal accounts (On The Horror Drunx.com site) of tracking down the elusive 1927 Lon Chaney vehicle thought lost for over 40 years. 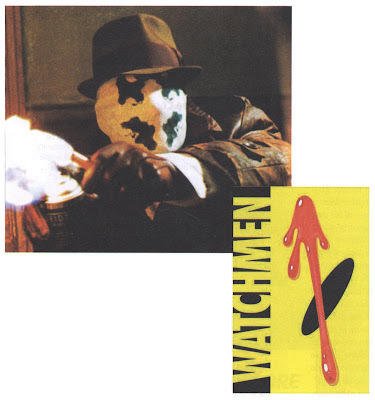 Well, everybody who has seen WB's The Dark Knight by now has had the extry-special mighty-fine treat of seeing the long-awaited trailer for The Watchmen (Alan Moore and Dave Gibbons' subversive 1986 inside-out take on the Superhero genre.) I can say for a fact that the preview crowd in attendance at The Regal Hollywood 24 last night went nuts when the first images from the trailer hit the screen. Of course, it was small potatoes compared the the near-riot that broke out later,when the projectionist ran The Dark Knight reels out of order. Wow, what an angst-fest! 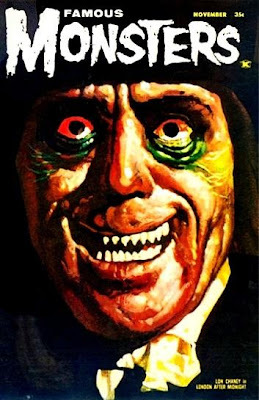 Palpatating, red-faced and rabid, the battiest of Bat-fans nearly beat down the projection room door, only to be told the Regal's resolve would be a pass for the next day-- because the movie -- still running and entering the climactic third act, could not be halted. Once they realized that, most fans RAN out in droves shielding their eyes, but not before security did some escorting-out of the unruliest. Okay I digress... but it seems like it's always something at that damn theater. 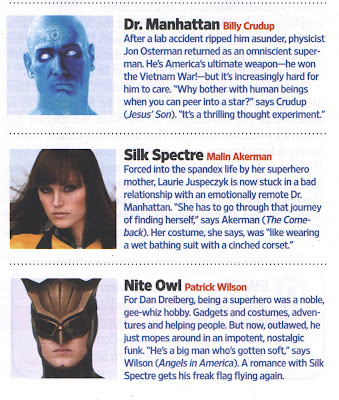 Aptly timed, The Watchmen movie is the lead and cover story on next week's Entertainment Weekly (7.25.08). I was actually staggered a little when I pulled this cover out of my mailbox today. "A sure sign of the Apocalypse" I said as I showed my wife the cover. She looked at it for a second and then said "Why? Because they got the costumes right?" "Uhhhh...Yeah..." I answered, looking at it a little closer. "That, too." The Watchmen has been big-screen bound for nearly two decades. I remember thinking that the Watchmen-esque scenes on the moon in 1989's The Adventures of Baron Munchhausen felt like more-or-less a warm-up act for director Terry Gilliam, who at that time was slated to direct The Watchmen as his next project. The property has gone through many hands since those days. But in the interim something has happened to the Superhero movie genre. Some might say it's "grown up". It's definitely become more serious. Much less playful. There is little resemblance in tone between say Batman (1966), Batman (1989), and The Dark Knight. Same characters. Whole different feel. (And I ain't even mentioning Schumacher's train wrecks.) Tim Burton's films were dark and ground-breaking for the genre, even though he really never took it beyond the comic booky/can't-take-it-serious tone --even in the most serious of scenes. 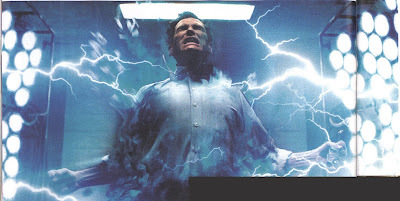 The Superhero movie of 2008 looks and feels more like a "real" movie. It's really required to by today's audience standards. With this in mind The Watchmen might have just been in the Hollywood hopper long enough to stand a good chance of turning real profit. Much more so now than say, a decade ago when a cynical group of heroes practically no one had ever heard of (cough... Mystery Men) was way harder to sell John Q. Public. (Reminding myself that HellBoy 2 was #1 at the box office last week) Still, I have to wonder if the movies' adult-oriented themes and apparent "R" rating will hurt the bottom line at the box office (...but then again, when I saw Team America at the Hollywood 24 the audience was almost HALF kids! Hoo-boy!). 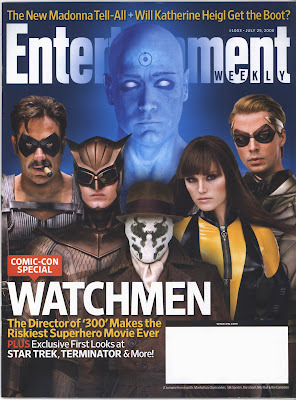 EW has a lengthy article about both The Watchmen movie and Comic Con in general --which with over 130,000 attendees expected this year has been super-sized to the point, that for me at least-- it's almost become counter-productive. (Yeah, I said it! Even on Thursday it's crowded as hell now!) Comic Con attendees (presumably thousands) can expect a special Watchmen presentation of previously unseen footage on friday July 25th. 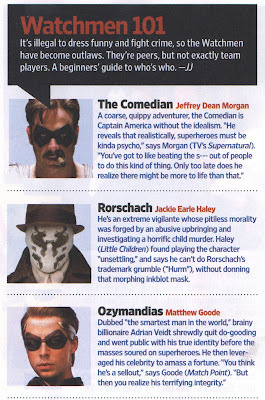 Anyhoo, here's a great who's-who of the Watchmen heavy hitters (put together by EW contributor Jeff Jensen) that should bring the laziest layman up to uh...super-speed. Hmmm. 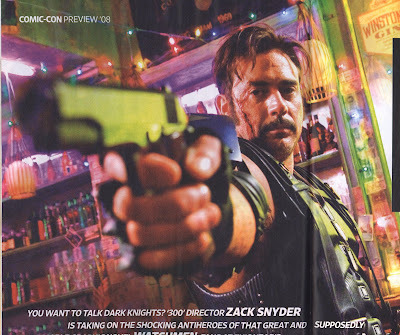 So, ya think Snyder mighta got it right? The 300 was pretty good, ...right? Well, since I'm trying to remain optimistic, I'll just have to hold out hope until it's released next year (March 6, 2009) that the original work by Alan Moore and Dave Gibbons is finally done justice. 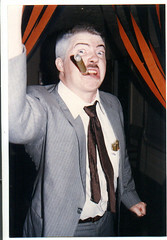 At least as of this date, Alan Moore still hasn't requested his name taken off the project. Yet. Big Thanks (and good luck) for this post go to Warner Bros. Pictures, DC Comics, Entertainment Weekly, Jeff Jensen, Alan Moore and Zach Snyder.